Insects, food of the future? Full of nutrients like protein, iron and vitamins, and both cost-efficient and environmentally friendly to harvest, insects just might provide the perfect alternative to meat -- were it not for the fact that they’re, well, insects. 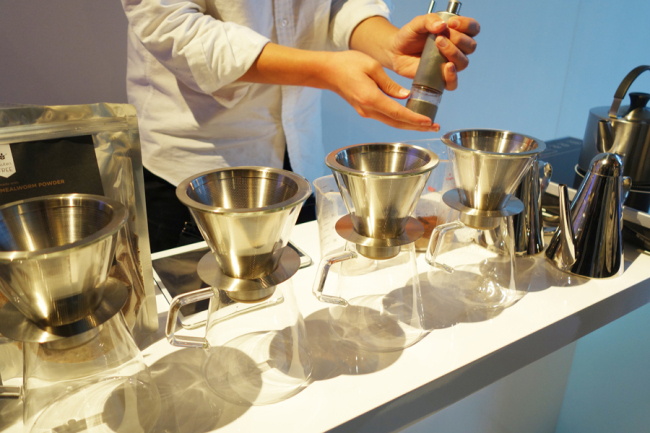 “I wanted to show that even something people think of as disgusting and unpleasant can be changed,” UZU told The Korea Herald at his exhibition, which featured neatly packaged flour, coffee and even desserts that incorporated insect powder. “It’s all a matter of perception,” he added, holding up a dainty, mint-colored macaroon made from black sesame seed and grasshopper powder. 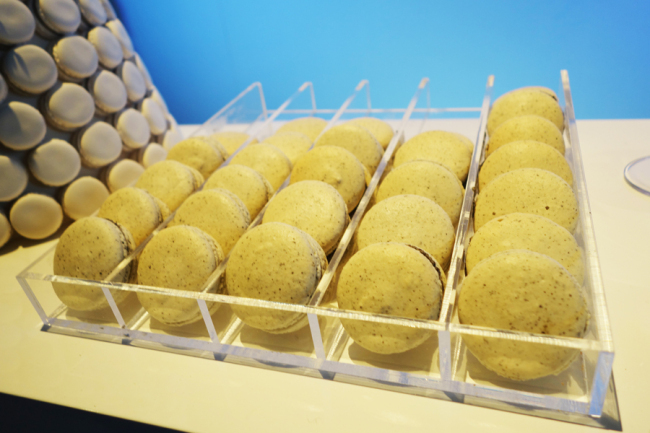 Visitors are also able to sample the macaroons -- which are sweet, nutty and surprisingly tasty. 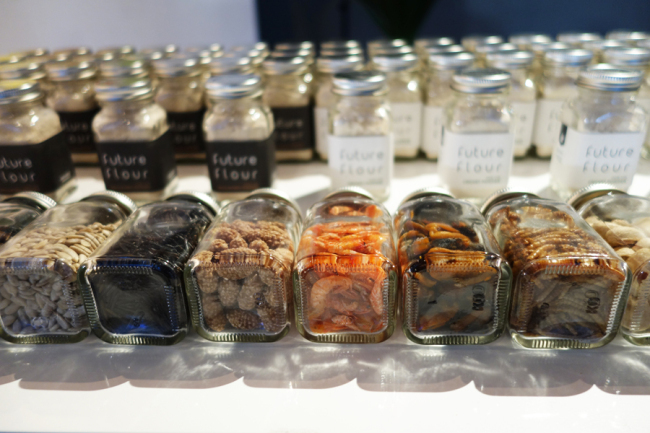 “I wanted to imagine what the food of the future would look like,” UZU said. Ever since the 2012 release of a Dutch health report that lauded the nutritional value of insects, they have been rising as an alternative food source in the face of increasing world population, depletion of resources, violation of animal rights in farms and the environmental detriments of large-scale farms. Edible insect farms have started to pop up in North America and are spreading to Europe, according to a CNN report, while some Latin American countries have been consuming the many-legged creatures for centuries. Even in Korea, insects are starting to make their way onto the dinner table. Papillon’s Kitchen, a restaurant in Seoul’s Jung-gu, serves an array of dishes including pasta, soup and muffins that incorporate insects. 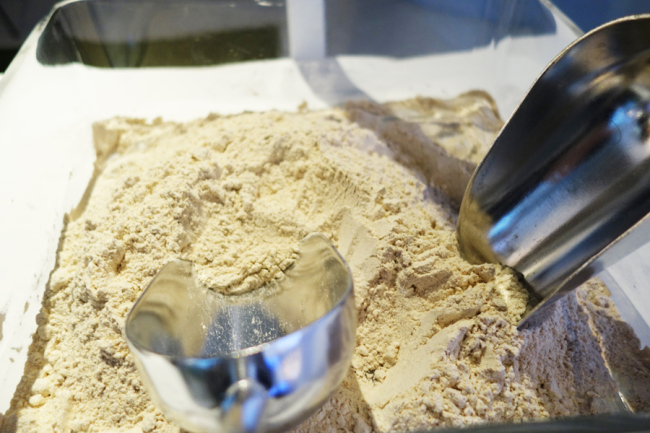 A handful of bakeries offer cookies and cakes dotted with bits of ground insect. More and more farms, like Sinwoo Farm in the Ulsan area, are breeding beetles, crickets and mealworms alongside traditional livestock. There are currently four types of insects authorized as edible ingredients by the Ministry of Food and Drug Safety, while insect farms are predicted to contribute to the rural farming industry. Insect cookies were also laid out at a recent ministerial conference at Cheong Wa Dae, Korea’s presidential residence, reports say.